A Wardrobe Trunk which gives us a profound feeling just from the appearance. It is specially large among our other items, and has more added value. The trunk that has been used for a long voyage is a most suitable to use as a furniture, as well as for your interior. What comes into view is a curtain made of canvas. It goes well with the design that has warmth peculiar to the tree, which gives more feeling of vintage. of 5 different types in heights and shapes. "Shirt Hanger" for top wears such as jackets and shirts. 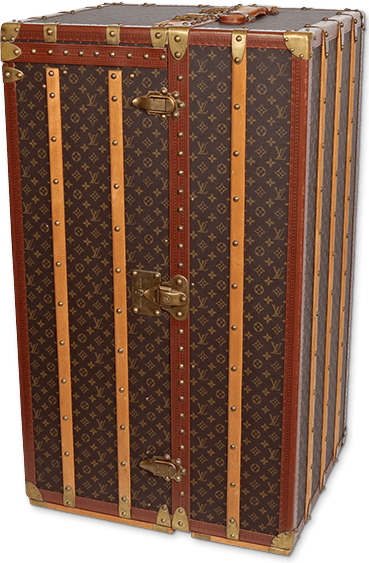 When you close the trunk, you will see "Monogram", a pronoun of Louis Vuitton covers every sides. The appearance with an atmosphere of a long history is something no other can have. It is one and only with a high quality design which sticks meticulously to small details. Pack your dream to this wardrobe trunk, and…Bon Voyage!